Background: Over the years, I’ve passed by Sleepy Hollow countless times while on my way to something or another in Liberty Square but never once stopped by to investigate. I even recall that once I caught a whiff of something wonderful while walking in that area, yet still didn’t bother to find out the source of the delicious smell. Then shortly before my birthday trip in May 2011, I read reviews here about the wonderful funnel cakes and giant Mickey Mouse waffles at Sleepy Hollow. I finally knew then what I had missed out on for all those years and I vowed that I would pay a visit to Sleepy Hollow on my very next trip. 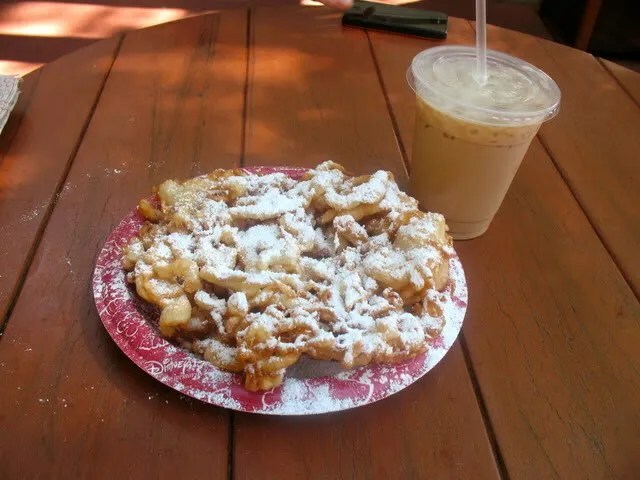 And so here is a picture of the delicious funnel cake that I shared with Allison on our trip last year. After spending the first hour or so of the morning in Fastasyland, I was more than ready for my breakfast treat. So anyway, after all this excitement you can see how we desperately needed a quiet and relaxing breakfast break at Sleepy Hollow. And so, I confidently walked straight up to their counter to place our order, as there was no need to look at the menu…I knew exactly what I wanted. The nice, elderly woman taking my order reminded me so much of my grandmother, who passed away almost 20 years ago. “I’ll have a Mickey Waffle with strawberries and whip cream, please,” I said in my most polite and respectful voice. And that’s when my bubble was burst by these words, “I’m sorry dear but we don’t have the Mickey-shaped waffles anymore, we now have only regular waffles or waffle sandwiches. 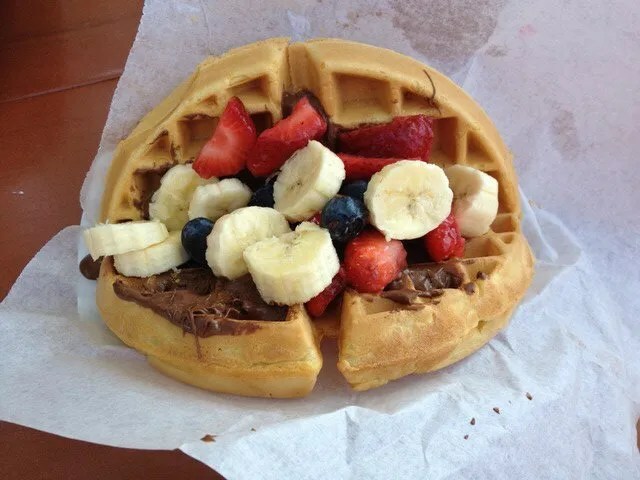 There is a Nutella and Fresh Fruit Waffle sandwich that is really good, would you like to try that?” Feeling somewhat defeated I replied, “Yes, Grandma (I mean, Ma’am), I will try that.” After all, how can you say no to your grandma, right??? So did it taste as good as it looked? Pretty much, yes! Two of us gave it a rating of “Very Good” and Allison gave it a “Good”, as she is not a fan of Nutella. At the time I didn’t think about it, but after reading Linda67’s recent review of this waffle, I would have to say that I totally agree with her. It definitely would have been better with a big dollop of whip cream on top. Then again, I think it might be worthy of a Tinkerbell “Excellent” rating if they also held the blueberries and the Nutella. So a waffle (preferably with, but acceptable without ears) with strawberries and bananas, and topped with whip cream. Maybe even add some chocolate syrup? Ahhh…Perfection! A girl can dream, can’t she??? In my defense though, the article was posted on Nov. 13, 2011 so I probably didn’t read it. Because where was I on Nov. 13, 2011?? ?…none other than Magic Kingdom!